Anglican Indaba can change the world. How many times has a National President taken time from his or her busy schedule to celebrate a companion link between two Anglican entities? Not many! This is what happened in Zambia. President Edgar Lungu celebrated the relationship between the Dioceses of Zambia and the Diocese of Bath and Wells in the Church of England. What a celebration, what a remarkable event, what a fantastic partnership. The President also focused on how significant Anglican models of partnership and Indaba are for the church and the world and for Zambia in particular. He called for more help from Anglicans in peace-building in the nation. At the heart of this is the remarkable Dean of the Cathedral, the Very Revd. Charley Thomas. In 2016 the temperature was rising around the country with outbreaks of violence between those supporting different parties. Charley hosted the leaders of the parties at the Cathedral for an Indaba in a context where all were equal. This was not a political debate, policies were not to be discussed, but an opportunity to speak truth, hear truth and make commitments to disagreeing peacefully. This is the context in which President calls for more assistance from the church. Charley has also influenced the Anglican Communion. His work with Janet Marshall on listening for mission in the book The Anglican Communion and Homosexuality helped shape the 2008 Lambeth Conference. The planning group embraced listening and listened carefully to Charley and Janet who spoke with them at a key planning meeting. When the Anglican Communion launched Continuing Indaba in 2009 the expectation was that the core subject would be human sexuality. There were good reasons for that: it was from the Listening Process on Human Sexuality that Continuing Indaba emerged. However, it was always more complex. Listening was and is about mission. The need to hear the voice of LGBT Christians was about all hearing the gospel. The processes of listening empowered the voices of many who had been silenced due to gender and ethnicity as well as sexuality. The process, when applied, drove reconciliation for peace with justice. Charley always knew this was the reality, listening is essential in mission. The work of the gospel is reconciliation. It is reconciliation between God and humanity and between us fractious humans. 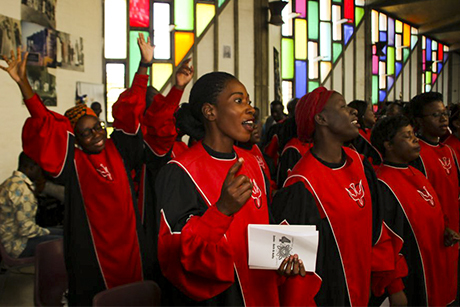 As Charley and others – especially African and Asian Anglicans – developed Indaba as a resource to enable conversations between Anglicans divided by culture, geography and wealth and between peoples divided by ethnicity or politics. Indaba enlivens partnership between Anglicans and it enables peace-building in local contexts. This is not an either-or situation. The same processes of humble listening energise companion links and enables peace-building in nations. The ACC meeting in Lusaka in 2016 declared that Indaba is the distinctive Anglican contribution to conflict transformation. Indaba can change the world.